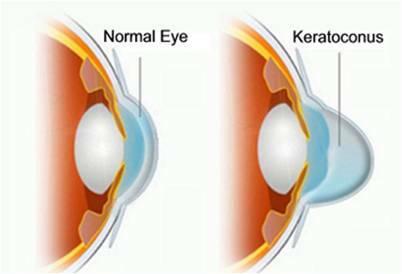 Keratoconus is degeneration of the structure of the cornea. The cornea is the clear tissue covering the front of the eye. The shape of the cornea slowly changes from the normal round shape to a cone shape. Causes, incidence, and risk factors: The cause is unknown, but the tendency to develop keratoconus is probably present from birth. Keratoconus is thought to involve a defect in collagen, the tissue that makes up most of the cornea. Some researchers believe that allergy and eye rubbing may play a role. Also, there is an association between keratoconus and Down syndrome. Symptoms: The earliest symptom is subtle blurring of vision that cannot be corrected with glasses. (Vision can generally be corrected to 20/20 with rigid, gas-permeable contact lenses.) Most people who develop keratoconus start out nearsighted. The nearsightedness tends to become worse over time. Signs and tests: Keratoconus is often discovered during adolescence. It can usually be diagnosed with slit-lamp examination of the cornea. The most accurate test is called corneal topography, which creates a map of the curve of the cornea. When keratoconus is advanced, the cornea will be thinner at the point of the cone. This can be measured with a painless test called pachymetry. Treatment: Contact lenses are the main treatment for most patients with keratoconus. Severe cases may require corneal transplantation as a last resort. Corneal crosslinking is another treatment option that is currently under FDA trials. However, enrollment into the study may vary and specific qualifications need to be met first. Prognosis: In most cases vision can be corrected with rigid gas-permeable/ClearKone contact lenses. If corneal transplantation is needed, results are usually good. The recovery period can be long, and patients often may still need contact lenses. Complications: There is a risk of rejection after corneal transplantation, but the risk is much lower than with other organ transplants. Patients with even borderline keratoconus should not have laser vision correction. Corneal topography is done before laser vision correction to rule out people with this condition. Prevention: There are no preventive measures. Some specialists believe that patients with keratoconus should have their eye allergies aggressively treated and should be instructed not to rub their eyes.